Looking for active MLS listings in your area right now? Download the Cross Realty myAgent by IDX application and find your dream home now using the dynamic map search tools right from your iPhone or iPad. After downloading the application be sure to enter our IDX Agent Code of 7491 or your agent’s individual code; this will get you immediate access to all the active MLS listings in the South Hampton Roads Virginia and North Carolina areas. 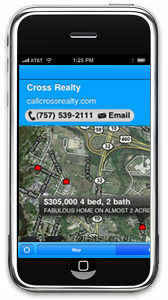 Click here to visit the iTunes App Store and download the free Cross Realty iPhone/iPad app! Do you know what makes an agent successful? We do. Cross Realty welcomes queries from those who are interested in joining our award-winning team. Call Harry today at 757-434-9084 to schedule a confidential meeting. Specializing in properties in South Hampton Roads, Virginia. © 2019 Cross Realty. All Rights Reserved.